It seems that everyone is talking about 3D television these days. A few friends and relatives who called up for advice regarding what TV to buy even asked if they should wait till next year to get a 3D TV. Given the recent interest, we thought it would be appropriate to give a brief explanation of the mechanics behind stereoscopy – any technique that creates the illusion of depth of three-dimensionality in an image. There is one basic preface needed in understanding 3D television: understanding how our eyes work. For the sake of this example, look at your computer mouse (or if you’re on a laptop, any other object nearby). In a nutshell, your left eye and your right eye are two separate lenses, registering two differently-angled images of the mouse, which are then sent to your brain. The brain then acts as the ‘image processor’, putting the two pictures together to come up with one three-dimensional picture in your mind. It’s basically the same principle by which the new FujiFilm FinePix 3D camera works. Making screens display 3D images is based on a similar mechanism, but is divided into two main wings: Stereoscopic TVs (which require special glasses to watch 3D movies) and Autostereoscopic TVs (which appear 3D without any special accessories). In the first part of this series of articles, we look at special glasses that are required by some of the upcoming stereoscopic TVs to deliver the 3D experience. The 3D technology that Panasonic, Sony and Nvidia are most gung-ho about in the near future is based on wearing what are called ‘shutter glasses’. Basically, these are glasses that alternately shut off the left eye and right eye, while the TV emits separate images meant for each eye, thus creating a 3D image in the viewer’s mind. Here’s how it works: The video signal of the TV stores an image meant for the left eye on its even field, and an image meant for the right eye on its odd field. The TV itself is synchronised with the shutter glasses via infra-red or RF technology. The shutter glasses contain liquid crystal and a polarising filter. Upon receiving the appropriately synced signal from the TV, the shutter glass is automatically applied with a slight current that makes it dark, as if a shutter was drawn (hence the name). So at a time, only one eye is seeing one image. The technology perfectly draws the shutters over either eye to make the left eye see the image meant for it on the even field, and make the right eye see the odd field of the video signal. By viewing these two images from different orientations, a 3D image is built up by the viewer’s brain. While it seems like this would cause a delay for the viewer, there’s no need for such worries. With the high screen refresh rates that these modern 3D televisions have, the end user’s viewing experience is seamless, smooth and rich. However, the one down-side of this technology is that due to the rapid drawing of ‘shutters’, lesser light reaches the eye, thus making the image seem darker than it is. Polarised glasses are basically your regular sunglasses, and have been used as a medium for 3D stereoscopic viewing for a long time now. They are also the most popular mode of 3D glasses, currently used by large cinema houses and IMAX. Just like the shutter glasses, polarised glasses use the lenses to show different images to each eye, making the brain construct a 3D image for the viewer. Here’s how it works: For polarised glasses to work, the movie being shown has to be shot using either two cameras, or a single camera with two lenses. Two projectors (left and right), both fitted with polarizing filters on their lenses, then simultaneously show the movie on the same screen. The polarizing filter orients images from the left projector to one plane (for the sake of example, let’s say ‘vertical’); and the filter on the right lens orients its images to the plane that is perpendicular to the left one (‘horizontal’). 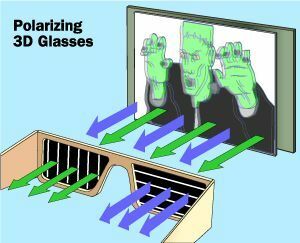 The viewer sits wearing the special glasses, which are equipped with differently polarised lenses. The left lens of the glasses is aligned with the same plane (vertical) that the left projector is throwing up images at; and the right lens is aligned perpendicularly to correspond with the plane of the right projector (horizontal). Thus, the viewer’s left eye sees only the images which the left projector is screening, while the viewer’s right eye sees only the images which the right projector is screening. As both the images are taken from different angles, the viewer’s brain combines the two to come up with a single 3D image. But again, like the shutter glasses, the amount of light reaching your eyes with polarised glasses is significantly lesser, making the image appear darker than it is. 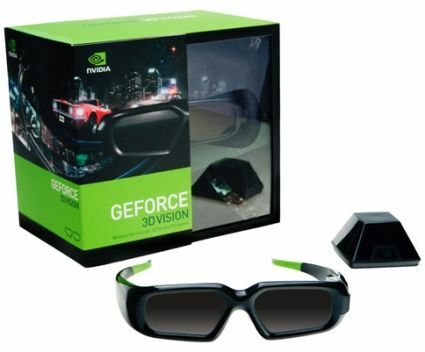 The biggest disadvantage with stereoscopic 3D TV is that it requires the user to wear a special apparatus. This is quite inconvenient and a burden, as it renders a large screen obsolete without a pair of tiny glasses; i.e. if you aren’t wearing the shutter or polarised glasses, the images on the screen will appear distorted. So what’s the alternative? Check out the second part of this article which talks about the technology behind next-gen television sets that don’t require the viewers to wear glasses or any special apparatus at all. NOTE: Some curious readers might want to know what happened to the red-and-blue anaglyph 3D glasses of old. Well, apart from making a lot of viewers nauseous, that technique was dependant on the studio using special colour filters while recording movies. The entire process was not worth the time, money and effort for the studios, so the technology is pretty much obsolete now, as far as mainstream video content is concerned.